Keeping in mind the needs of developers working on devices with Bluetooth Smart also called Bluetooth Low Energy (BLE) connectivity enabled like wearable devices, BLE beacons, custom BLE modules etc, Embien has developed a Bluetooth scanner for Android named BLE Suite. Aimed to be the Swiss Knife of BLE developments, BLE Suite offers rich functionality for debugging devices. Users can view list of available devices, connect to them, read or write data to the characteristics. BLE Suite Bluetooth scanner for Android application is logically designed and visual elements organized in a manner easy for user interaction and management. Up on opening the BLE Scanner app, the device Viewer is shown in which all the detected devices are listed. Up on clicking the device viewer, the device information view is shown which have multiple sub-views navigate-able using Tabs. A Service browser view lists the services, characteristics and descriptors available for the device. A widget view screen enables visualizing the view data using multiple UI widgets and finally a Log viewer shows the internal events that happened during the interaction. Few screen shots of the BLE Suite application is given below. As described earlier, the Bluetooth BLE Android app has primarily a Device viewer in which all the available devices detected by the Android OS are listed. Apart of the device name, the address and RSSI are also shown. Against these devices there is a button displayed with option to Connect or Disconnect based on the current connection state. The devices are scanned up one entering or automatically rescanned in the configured time period. User can initiate a scan any time the Scan button is pressed. Once a device is connected and clicked, the user is provided with following options. If it is a standard UUID as defined by the Bluetooth Low Energy Profile standard, corresponding name is shown. Option to change the format in which the characteristics data has to be accessed. Option to enable or disable Notifications for the characteristics. While the Service Viewer provides information in textual format, the Widget screen helps in viewing this in a logical manner using UI elements. To show BLE Device address, RSSI, Number of Connections/Disconnections and time information about the connection. To view Model Number, Manufacture Name, Serial Number, Hardware and Software Revision of the device. To show X-axis, Y-axis, and Z-axis Value and Polling Interval with configurable base value. Has configurable mode selection and an Alert now button. User configurable data format for any custom Service and Characteristics UUID with read and write. This screen can be used to view all the log information accumulated for the selected device over the period of operation of the Bluetooth 4.0 scanner. Selected events specific to Connection, Read and Write Characteristics and Notifications etc. Displays time and type of Log data. Clear all the log information in single click. Such a list of attractive features make BLE Suite an ideal candidate to aid in BLE device development and debugging. 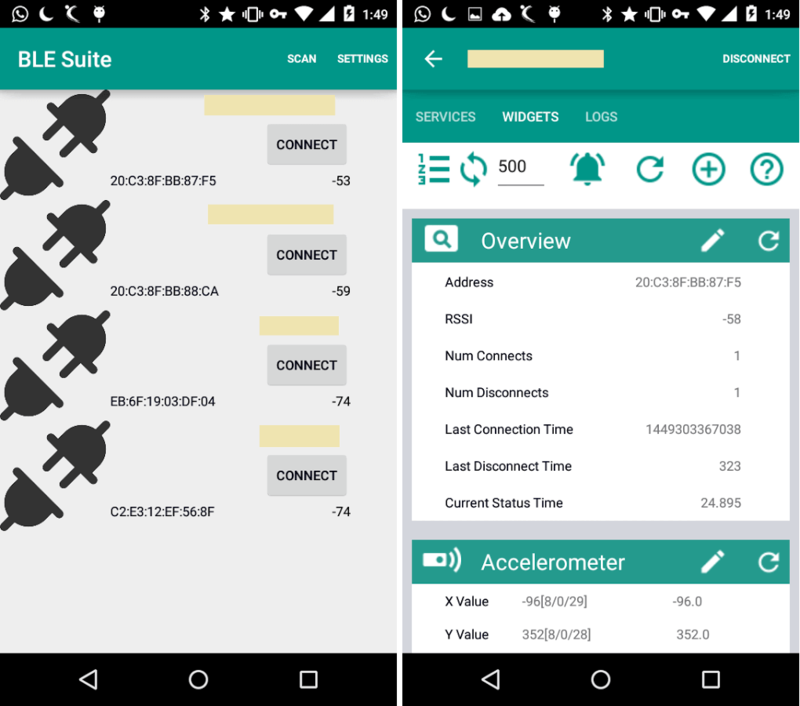 The BLE Suite is available for free of cost at the Google Play Store. Feel free to download it, use it for your activities and let us know if you think any more improvements can be done. Embien Technologies has rich experience in developing BLE devices for Consumer, Medical and other industries including BLE beacons, custom BLE modules and wearables. We have developed many Bluetooth BLE Android apps to work with such kind of devices. We look forward to hear more about your requirements in this regard.